Digital Estate Planning for Filmmakers: Part 1. As a filmmaker you are most likely not investing in a 401k or blue chip stocks & bonds. You are however investing your life into digital assets. Your digital assets can be be worth millions of dollars and if not protected can be lost forever in your passing. Some filmmakers have become savvy to their digital assets and created Trusts and/or Wills that take into consideration their digital assets for future generations after they’ve passed. Brandon Johnson has worked in the film industry for 30 years and has acquired a vast archive of personal, commercial, and film media. He has a large stock footage collection that is represented by Nimia, Getty, and Corbis, he’s made 5 documentaries for non-profit organizations related to clean water issues in developing countries, and built a substantial library of footage from historical world events when he worked for a large news agency as a photojournalist. Brandon chose to leave his stock footage library with the respective agencies so they continue to generate revenue for his Trust. He wants 70% of those profits to go to his wife or the next living kin. Brandon wants the remaining 30% of revenue to be invested as the trustee sees fit. Additionally, Mr Johnson chose to donate all of his world news coverage to the Smithsonian as he’s passionate about preserving those pieces of history and sharing his images with as many people as possible. Lastly, he wanted full copyright of his documentaries transferred to his longtime business partner so his organization can use the content to continue to build awareness about its cause. You are going to die someday. It’s not fun to talk about, but it’s true, there is no escaping this fact. The following article explains digital estate planning for filmmakers and media producers. Estate Planning isn’t a privilege for wealthy families. It can be a useful tool for media producers to protect their family and their media assets. The primary purpose of estate planning is to arrange family affairs and to protect property. The property involved does not have to be physical property like land, houses, buildings, or stocks & bonds. Digital property is quickly becoming a valuable asset that should be considered in Estate Planning. This article is Part 1 of a series on Digital Estate Planning for filmmakers and media professionals. Let’s start with another hypothetical example. Ethan is a 42-year-old acclaimed producer. He traveled extensively for work and has archived more than 4,000 video footage clips that he’s shot over the past 15 years. He’s utilized Nimia Legal to help secure ownership of a portion of his 4,000+ video footage library. Ethan is a single father with an eight year-old son. From time to time he shoots in difficult locations under extreme conditions. Occasionally, Ethan wonders, “what if some crazy accident occurs to me… What would happen to my son and my life’s work?” Ethan has a vague idea of estate planning, but he is clueless about where to start. Ethan will encounter two main approaches to digital media estate planning: wills and trusts. A will enables a person to direct the disposition of his estate as he wishes. If a person dies without a will, his spouse and descendants usually inherit the entire estate under the applicable state laws. For example, in Washington the default is half to your wife and half to your children. Friends, siblings and parents may be left out. If a person has specific thoughts on how to dispose his digital media estate, setting up a proper will may be the right answer. For example, in the case of Ethan, he may want to give his best friend Doug the copyright to the “MotoX” series for memory of their friendship. Ethan may also want to donate $1,000 to the Seattle Art Museum and $1,000 to his church. Ethan needs to set up a will or trust to express these arrangements. A trust is an arrangement in which one person has an obligation to keep assets for the benefit of another. It’s similar to a will, but more complicated and has a few additional benefits. Let’s explain by example. Ethan has digital media assets he wants to protect from creditors and since Ethan is a single father he wants a professional agent to manage his media assets so that his son can receive the yields, eg., if Ethan dies unexpectedly, Ethan’s son is not old enough to actively monetize media assets. In addition, if someone sues Ethan, creditors will try to take his digital assets. A trust will help protect his son and protect his digital media assets from creditors. A basic trust relationship is illustrated in the chart below. 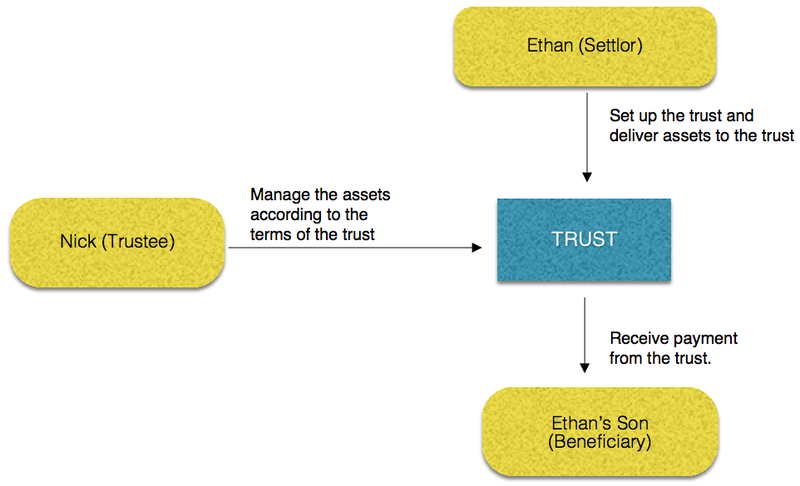 Ethan is presented with two choices: wills and trusts. He is more familiar with wills, and for him a trust seems like a limited privilege for very wealthy families. However, Ethan soon learns that using both, a will and a trust, can be a useful tool to protect his digital media assets as well as his son. Both wills and trusts can enable persons to dispose their property. A will does not dispose the assets during the person’s lifetime, while a living trust requires the assets to be delivered to the trustee to establish a valid trust. There are several reasons people would set up a living trust. First, the trust will have a reliable trustee who bears fiduciary obligations to manage the assets. This is helpful when the beneficiary is a minor. Secondly, unlike a will, a living trust can avoid the need of probate court upon the person’s death. Thirdly, a trust is usually more private than a will, which could be important to some families. Finally, if properly designed, a trust could bring tax benefits when passing the estate to the next generation. However, there are some downsides of a trust. First, a trust requires attorney fees for preparing a trust document and administration expenses. Furthermore, a trust only deals with monetary/property matters. A person still needs a will to appoint the guardianship of young children, or to arrange life support or organ donation. Therefore, in many circumstances, a hybrid of both a will and trust is used for estate planning. Ethan decides to make both a will and trust to achieve the following objectives: (a) name his cousin Julie as a guardian for his son Matt until Matt reaches 18 years old; (b) grant his best friend Ernst the copyrights of “X-Game” series; (c) donate $1,000 to the Seattle Art Museum; (d) pour all the residuary legacy, 4,000 video assets and all the proceeds of Ethan’s life insurance policy, to the family trust (a living revocable trust that will be discussed later); and (e) reject any life support if Ethan falls terminally ill.
1. Before starting the digital estate planning process, media producers need to organize and manage their digital media assets. Since media assets constitute a majority of producers’ assets, it is vitally important to build and safeguard a warehouse of your media assets well in advance of your estate planning. 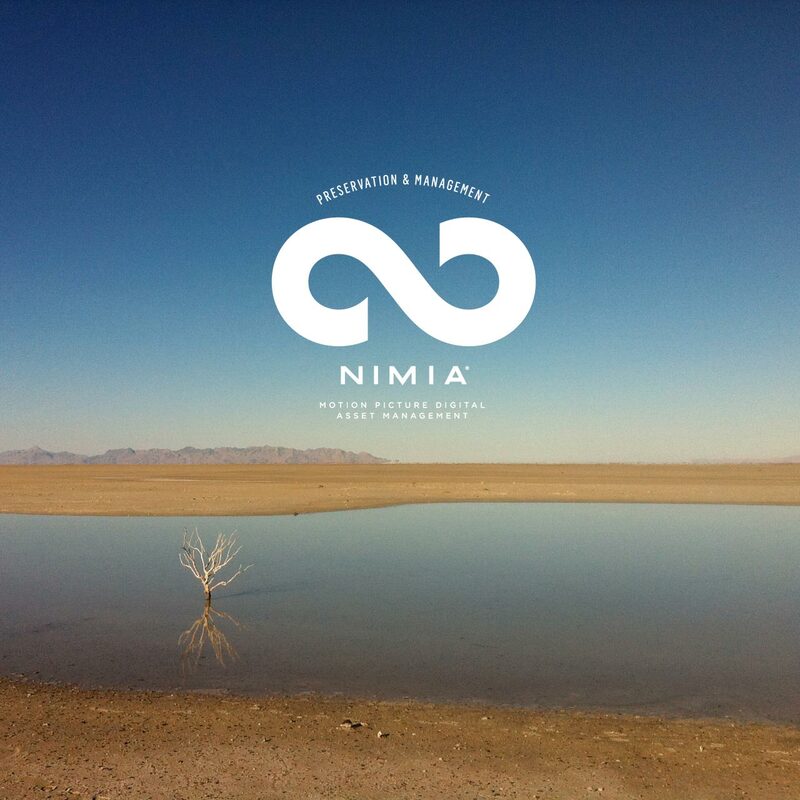 (Selfless reminder… Nimia provides a badass Video Asset Manager to help archive and manage your life’s work, here’s a link to sign up). (1) Create a comprehensive inventory list of all his media assets. A producer using Nimia can see a clear list of all his entire video library in his Nimia asset manager. (2) Create an inventory list of other digital assets, including social networking profiles, blogs, webpages and domain names, online financial informations, digital photos, other online accounts/information, computer and phone information, email information, and sensitive information. It is important to understand each website’s service agreements. Some websites prohibit any third party, even the person’s heirs, to access the content or transfer the data. Ethan may need to migrate to a website which allows his heirs to access the data. (3) Store his media assets in a reliable place. This gives Ethan the ability to hand them over to his children, family members or friends. 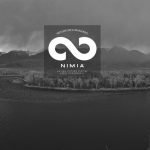 Nimia provides a secure place to store media assets for producers. (4) Complete copyright registration for media assets. Under 1976 Copyright Act, Ethan does not need copyright registration to obtain the copyright. Once he creates a video work he owns the copyright. However, a timely and proper copyright registration will allow Ethan to bring copyright infringement claims and seek statutory damages. For details on the benefits of registering your copyright, click here. For the details on the copyright registration process, please click here. (5) Commercialize media assets. The copyright of a work created in and after 1978 endures the lifetime of the author and 70 years after the death of the author. Therefore, as a producer, Ethan does not want to see his valuable footages sitting there without generating any revenues during such a long time period. A good way to commercialize his media assets is to display them in a market place like Nimia so that potential buyers from all over the world can view and purchase the licenses needed to use his video footages. (6) Actively monitor and seek settlements from people infringing his copyrights. Nimia Legal may provide such assistance with cease and desist notifications and collections. In the case of Ethan, as we discussed earlier, the majority of his estate is the copyright of the video footages, which are managed and stored on the Nimia platform. His agent Nick is a good candidate for managing those media assets. Ethan is a single father of a young son, Matt. He bought life insurance since he shoots in extreme weather from time to time. (1) Life Insurance Trust for the proceedings from his life insurance with a spendthrift clause. Proceeds from Ethan’s life insurance policy will be remitted to this trust, whose sole beneficiary is Ethan’s son Matt. As a minor, Matt is not capable of managing the assets. The trust will have a reliable trustee, either a corporate trustee or an individual, to handle the financial investment and look after Matt’s financial needs. To prevent possibly irrational use of the trust funds by Matt, the trust could place a limit on how much Matt could withdraw each year even after Matt becomes an adult. (2) A living revocable trust to manage Ethan’s media assets. Ethan’s agent Nick will be the trustee. The beneficiaries include Ethan himself and Ethan’s son Matt. Ethan may use annual gift tax preclusions to transfer such assets to his son gradually so that in the future his son would not be obligated for estate taxes. Further, in case any accident happens to Ethan, the management of the assets run by Nick will go on smoothly. Jennifer is a freelance cinematographer. Her hobby is to discover and shoot videos of flea markets all over the world. Jennifer’s videos turn out to be highly valuable. Her husband Jack is a surgeon. Early this year a former patient brought a malpractice lawsuit against Jack for damages over $2 million. Even though the claim was finally settled, both Jennifer and Jack are worried that litigations may happen again and may impact on their assets. Jennifer truly does not want to lose her videos that she cherishes so much. Jennifer’s goal is asset protection from future creditors. She may choose a living irrevocable trust, like a GRAT. Jennifer and Jack may put the real estate, stocks and the videos into the trust. Their son will be the beneficiary. Jennifer and Jack may still receive annuity from such GRAT trust, but the assets under the trust are no longer the couple’s. For this reason, Jack’s creditors could not put a claim on the assets. Mike owns an advertising company. The asset portfolio of Mike and his wife is worth $2.3 million, including the company, real estate, camera equipment and video archive. Their daughter just graduated from college and works in Mike’s company. Mike and his wife plan to retire in 10 years. They would like to leave their daughter enough money down the road (possibly half of their assets). Mike’s major concern is the considerable amount of estate tax that will be owed. To minimize estate tax, Mike may consider a Crummey Trust. Every year Mike and his wife will transfer $28,000 to the trust. Mike’s daughter has the power to withdraw such assets within 30 days. If the daughter does not exercise such withdrawal power, the assets will stay in the trust. Because of the existence of withdrawal power, the assets transferred to Mike’s daughter are eligible as a “gift”. Since each year Mike and his wife both have annual tax exclusions for gift tax as much as $14,000, the transfer of these amounts fit into annual exclusions and become tax free. Over the next ten years, a Crummey Trust could help Mike transfer a considerable amount of assets to his daughter and avoid substantial estate taxes. Please contact your Nimia Agent to inquire about creating a digital estate plan for yourself or your business: [email protected]. To learn more specifics about wills and trusts read Nimia’s full report digital estate planning. To download a sample will document click sample will for media producers. Stay tuned for Part 2 of our series on Digital Estate Planning for filmmakers and media professionals. Rochelle L. Haller, Estate Planning Consideration for Digital Assets. Eric J. Harrison, Esq. is a registered attorney licensed to practice in Washington state. By accessing and reading this article, you acknowledge and understand that no attorney-client relationship has been formed and you further acknowledge and understand that this article is not intended to constitute legal advice. Legal advice and counsel requires a fact-specific analysis of your particular issues, and you should thus obtain legal advice directly and individually from an attorney licensed to practice in your jurisdiction, if appropriate.